Mahum Shabir talking about the Handwara case. Source: Swar Thounaojam. The discussion began with Mahum Shabir giving an overview of the work at the Jammu Kashmir Coalition of Civil Society, specifically on the Handwara case. She spoke of the role of the internet, and social media in particular, in perpetuating the gaze of the state, while also bringing up the larger question of how media propagates a certain way of looking at Kashmir, particularly women, marginalised groups and victims of violence. Internet blockades and media censorship pose several obstacles for the circulation of information, resulting in the need for surreptitious ways of communication as a necessary way to counter predominant narratives in the discourse around occupation. The implications of these for the rights of women in particular, the curbs on freedom at different levels, and the undercurrent of violence that is prevalent in everyday life, came up as significant questions. Mir Suhail presented some of his cartoons, and shared some poignant personal experiences of growing up in a state under military occupation. His works reflect his concerns about a changing society, from understanding strife as an almost normalised state of existence, to now a phase of industrialization and control of resources. He spoke on the politics of exercising creative freedom in the present, and his attempt to encourage conversations on contemporary issues through his art. The role of technology in facilitating these conversations is as crucial as it is contentious, for it also brings up questions of surveillance and privacy;his art tries to navigate through some of these questions in different ways. Habeel Iqbal, a lawyer who has worked on the Shopian and Handwara cases, spoke on some of the legal aspects of censorship and surveillance related issues in Kashmir, particularly in instances involving social media. He discussed some of the challenges faced by activists, social workers and political groups in working on certain cases, particularly in gathering and circulating information or in writing about sensitive issues. Self-censorship is often the only option for people working on these issues, as he elaborated through some personal experiences. The discussion included questions on the possibilities opened up by privacy tools, such the use of encryption and to the extent to which they affect communication. Access to these technologies is a factor here; besides, transparency is also a goal for most human rights organisations working in the state. Social media, and social messaging apps in particular often function as an alternative to mainstream media as a means of communication, and it is interesting to see the questions it opens up for censorship. Examples of activism using not just the internet, but the network (through USBs and hard drives) were also discussed. The responses to such forms of activism, from across the world were interesting to engage with, as it tries to tackle predominant perceptions about the state. The economic aspects of different strategies of censorship and surveillance, through curfews and blockades and its broader implications for socio-economic development in the state were also discussed. 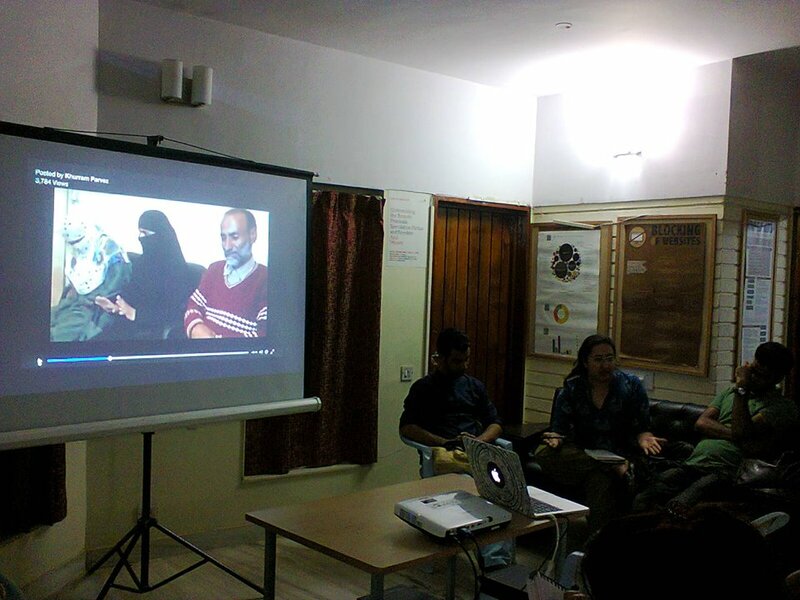 The talk provided several insights into the problems and challenges to freedom of speech, the censorship of ideas, and its repercussions for creative freedom and politics in Kashmir. 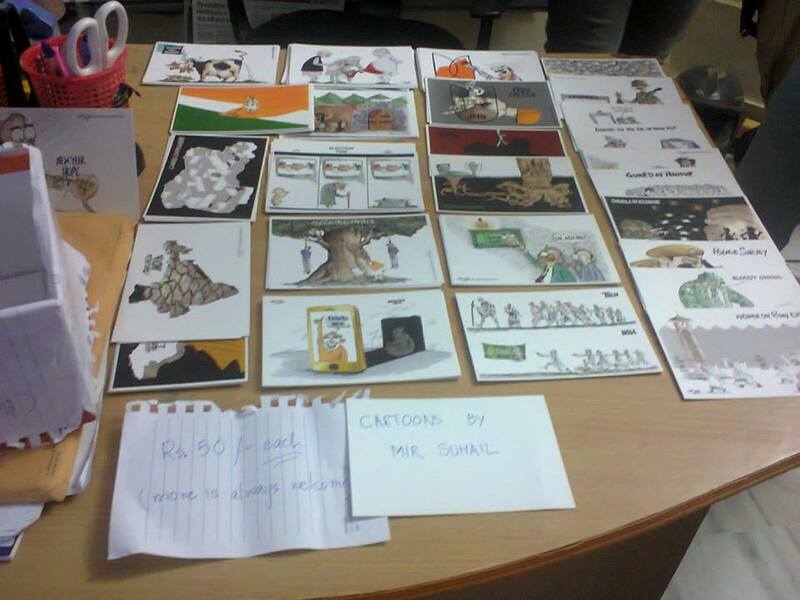 Postcards of cartoons by Mir Suhail. Source: Swar Thounaojam.